And Sandie White with the Esmond Selwyn Trio, a combination of jazz greats made up of White, one of Sydney’s top jazz singers, Selwyn, one of the UK’s greatest performing jazz guitarists, drummer Brian Abrahans, who has worked with just about all the world’s top jazz artists at Ronnie Scott’s Jazz Club in London, and Geoff Kluke who is renowned as one of Australia’s greatest bass players. 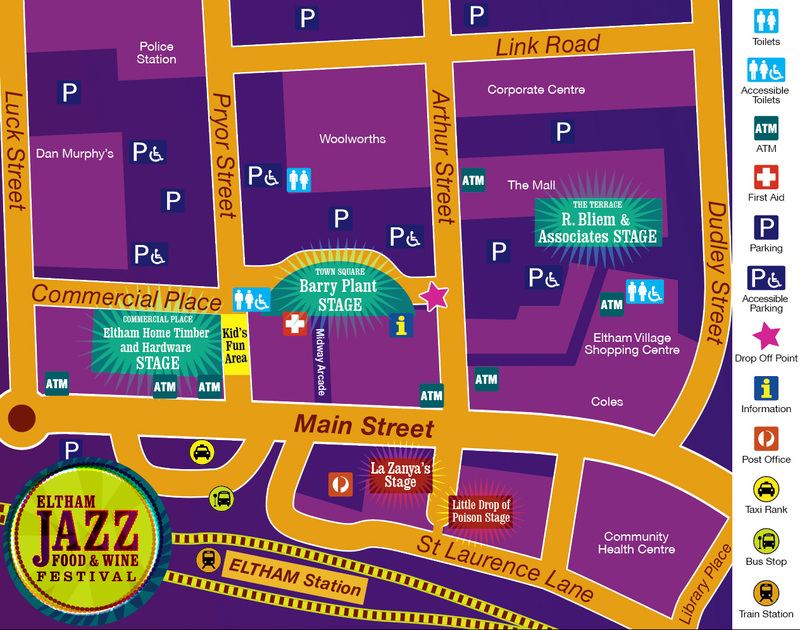 The 2016 Eltham Jazz, Food and Wine Festival offers great fun for everyone—and it’s free! This year is the 20th anniversary of the festival and it’s taking place this weekend of 27th and 28th February. The festival ran initially for just half a day with a handful of bands, and has now grown to a two-day event with almost 30 bands playing on three stages located in Eltham’s town centre. On top of the great entertainment, the festival offers sumptuous food and award-winning local wines, as well as a designated kids area filled with fun activities. An exciting array of jazz, swing, blues and rock’n’roll artists will be performing over the weekend. Saturday’s line-up on Stage 1 in the Town Square will kick-off at midday and festival-goers can dance the night away until 11.30pm. Headlining on Saturday night 9pm is the incredible Sun Rising – The Songs That Made Memphis, Australia’s premier rock’n’roll show that pays homage to the amazing artists of the Sun Record Company, including Jonny Cash, Jerry Lee Lewis, Elvis, and Carl Perkins. Other great acts playing on Saturday include Greg Champion & The Cool Rockin’ Daddies, The Seven Ups, and The Glass Moon. Sunday begins at 11am with a parade around the town by the famous marching band and stilt walker—a fantastic event for all the family. The music starts on Stage 1 at midday with the New Orleans Pelicans Brass Band and ends with the Groove Doctors and Soul Sacrifice, playing until 6pm. The Eltham Jazz, Food & Wine Festival Committee is sad to announce the resignation of Joe Karlovsky, our Musical Director for the past five years, and wish to thank him for the tremendous effort and talent he brought to both this role and as a general committee member too. His enthusiasm and dedication as Musical Director ensured that the program was varied, professional and enjoyable for everyone, and included both established and exciting new talent. The Festival’s Patron Geoff Kluke, one of Australia’s finest jazz musicians and teachers, has now taken on the role as Musical Director, with back up from his talented wife Jan in a ‘two for one deal’, which the Festival is lucky to benefit from. Geoff has performed widely in Australia and abroad with some of the greatest jazz musicians of our time and so he brings a wealth of experience and knowledge to this role. The Committee looks forward to working with both Geoff and Jan in the lead up to the 2015 Festival. Keep your eye on the Festival’s Facebook page and the website for announcements on next year’s artists.